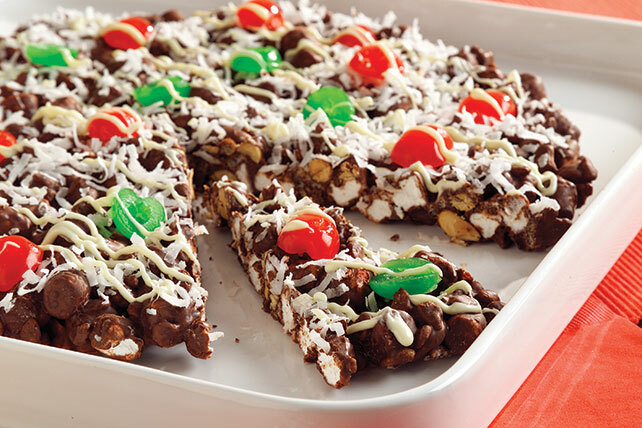 Create a crunchy marshmallow, chocolate, peanut & cereal crust for Chocolate Pizza! Top Chocolate Pizza with cherries & coconut for a kid-pleasing dessert. Microwave semi-sweet chocolate and 8 oz. white chocolate in large microwaveable bowl on HIGH 2 min. ; stir. Microwave 1 to 2 min. or until chocolates are completely melted and mixture is well blended, stirring every 30 sec. Add marshmallows, cereal and nuts; mix well. Spread onto bottom of 12-inch pizza pan sprayed with cooking spray; top with cherries and coconut. Microwave remaining white chocolate and oil in small microwaveable bowl on HIGH 1 min. ; stir. Microwave 30 sec. to 1 min. or until chocolate is completely melted and mixture is well blended, stirring every 15 sec. Drizzle over coconut; let stand until firm. Since thes family-pleasing chocolate pizza serves 20, it's the perfect treat to feed a crowd of kids.